Compelling "The entire state of Colorado has wept and gasped as Eddie continues to surprise us. Nothing has come easy for Ed. He has fought like a champion." Team Reinhardt (Ed, Pat and Ed Jr.) work with organizations and individuals who want to turn obstacles in life into opportunities for growth. They share their journey of anguish, love and empowerment - and show how ordinary individuals can do extraordinary things. For the past 18 years the family has been involved with Ed Jr.'s recovery from a brain injury in a football game while playing for the University of Colorado. He spent 62 days floating between life and death in a coma. His rehabilitation has taken years. Four of their five sons played Division I Football. John at Nebraska, Edward and Tom at Colorado and their youngest son Matthew at the University of Oregon in Eugene. In fact, athletes from the Reinhardt Family have played in eight major college bowl games. 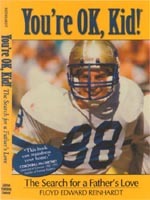 Eddie, tight end #88, was a member of Coach Bill McCartney's first recruiting class at the University of Colorado. He was second in the nation in pass receptions and was named to the Big Eight All-Academic Team with a GPA of 3.25 at the time of his accident. Their story inspires us to look closely at our own relationships and challenges us to make them better. Heartwarming "The message you shared with us was very heartwarming and inspirational. Your presence at the opening meeting set the tone for the remainder of our conference." Become aware of your strength which can help you to turn adversity into opportunity. Discover the power forgiveness has in relationships. Recognize the benefits strong families bring to business and society. Take up the challenge offered by Ed Jr. to reach your own success. Be uplifted by the musical talent of Ed Jr. and the story of one family's miracle. Powerful "It was one of the most powerful and touching experiences for our school in recent memory." © 2003-2007 - You're Ok, Kid!